Located in East Village, Paul's "Da Burger Joint" serves delicious burgers, sandwiches, omelettes and more! We can be described as a 50's eatery with counter service, checkered table cloths and vintage decorations. Many people have described us as "their home away from home" because of the friendly cozy environment created by our hospitality and style. Regulars enjoy sitting at the counter and talking with the cooks that they know by name while eating a big juicy burger and sipping on cold beer. We provide a big portion of high quality food at a reasonable price and do our best to satisfy all customers. We look forward to dining with you over and over again! I understand that this is only a notification of the gift. The recipient will need to claim the physical or email gift certificate using the confirmation link that will be emailed to them when I finish with checkout. 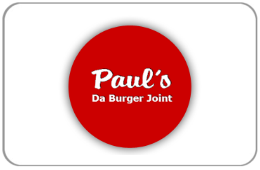 For balance inquiries call the phone number to a Paul's Da Burger Joint's location below.